Tell us about yourself: I am a fighter who wanted to compete in Muay Thai. However, I happen to live in the U.S. (where real muay thai is too dangerous) So, I wound up competing with modified muay thai, and then that got too "boring" for all the promoters because "no one wants to watch people hug" so all I can get are Oriental Rule (K-1) fights. I've got 17 amateur fights (lost 4) and I'm probably going Pro. I'm considered one of the best amateur middleweight kickboxers in the U.S. by some, I think I'm in the Top Ten in the Eastern U.S. I hold 3 Sanctioned Belts and 2 Event belts. I also held the IKF 2001 Amateur Light Heavyweight Southeast Regional Belt. Guess that about sums it up. 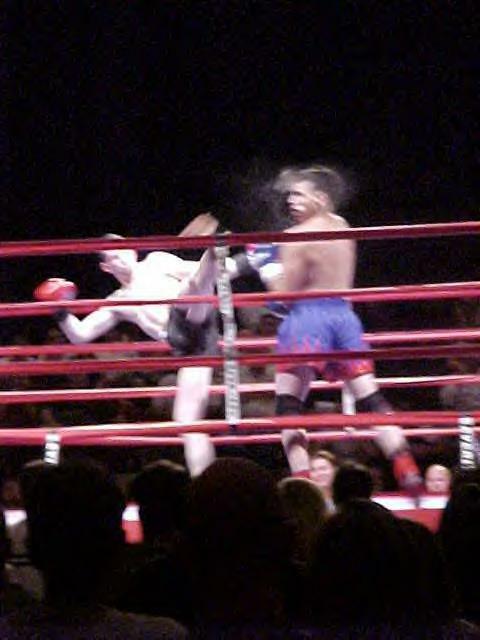 Here's a picture from my fight on November 21, 2003 where I won my International Title. I fought Nelson Colon of Puerto Rico. He was undefeated...until he met me.